Stewart Lee - 41st Best Standup Ever! Top Gear: can any mortal control this foul, pulsating orifice? 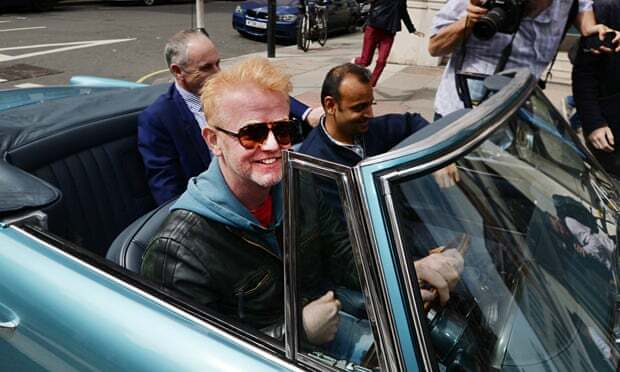 The Britpop DJ and breakfast television innovator Chris Evans is a brave man. But perhaps he has a suicidal streak. Or maybe, more nobly, he has discovered a belated desire to do some good in the world, as if to atone for the crimes of his past, before walking willingly to his inevitable doom. Like Gene Hackman’s crazy priest in The Poseidon Adventure, Jesus Christ from the New Testament or the nuclear clean-up crews at Fukushima, Chris Evans’s odds of surviving the job he has taken on are not encouraging. But he is doing something that needs to be done, for all humanity. Because, for years now, a vast, gaping inter-dimensional sphincter, the size of a gothic cathedral rose window, has throbbed and dilated silently at the heart of the BBC buildings on Upper Regent Street, belching fossil fumes and foul thoughts from a dark realm of negative space. I saw inside the pulsating meat oculus once, caught unawares as I stumbled across the Dave channel late at night, drunk. There, between Lee Mack’s laughing face and Robson Green’s leaping fish, compelling footage of the fetid portal’s sickening interior unfurled endlessly into the small hours. I saw it, so you don’t have to. In a fiery lake, through a carbon cloud, precious saplings were torn from their roots, the many and varied peoples of all the Earth were denigrated with arcane curses now largely vanished from the lexicon, inverts were sodomised with presumptuous jibes, a half-blind statesman was branded a “one-eyed idiot”, and a poor slave, penitently proffering a tray of sandwiches, was punched in his tiny face, to the indifference of drunken onlookers. To me, it was a vision of hell as vivid as Camposanto’s wall-daubed Triumph of Death. To others, it is merely banter, harmless banter. I clicked rapidly forward to the relative comfort of The Nazis – A Warning from History, but once seen, the space-sphincter’s contents could not be unseen. No one at the BBC can quite remember when the evil muscle portal was first opened, or when it began to be a problem for the broadcaster. Elders of the organisation, bent double upon their sticks like the ancient Eric Gill patriarchs adorning their architecture, say the hole of hatred began life innocently enough as some kind of motoring consumer programme, once reputedly presented by the likes of Quentin Willson and Angela Rippon, though all evidence of this has been destroyed. Matters came to a head last year when, after an especially violent rumble, the fractious sphincter suddenly ejected a massive torrent of bile from deep within itself, out of the cellar where it dwells, through the hot-desking communities of the BBC, and into Langham Place, carrying strange creatures alive and dead from inside its horrifying maw (a two-headed turtle, a flatfish with pendulous lactating breasts, and a mummified cat that looked like Steve Howe from Yes). In the shadow of All Souls Church a giant transparent squid, that had been spat out from within the sphincter, suddenly blistered in the sun and burst its guts, spilling out a succession of rusted car registration plates, each carrying coded insults to the war dead of vanquished nations. Thankfully, an independent internal investigation decreed all this mere coincidence, and the exonerated hate-sphincter continued its malicious throbbing undisciplined. This was, perhaps, the moment at which all chance of controlling the entity was lost. In the liberal press, the usual bleeding hearts called for the poisonous vacuum to be sealed with hot wax. But, removed from public opinion in their lofty Islington ivory towers, they could not comprehend the sphincter’s allure. The prime minister himself confessed a fondness for the foul opening’s charms. Chillaxing at night, wine goblet in hand, Dave tunes into Dave and gazes vacantly at the ever-dilating aperture’s flickering but seductive pantomime of hate. Temporarily tranquillised, like all the duct’s followers, he is purged of his own covert evils by witnessing overt cruelty made flesh. To close the portal permanently would make an already wounded BBC, itself a fixture of the culture secretary’s kill list, vulnerable to the criticism that it does not reflect the public it is charged to serve. To leave the depraved sphincter open and rumbling risks the release of further terrible evils into the world, the chance of international diplomatic incident and the shame, as the Earth chokes itself to death, of being on the wrong side of history. The toxic sphincter is like Hitler’s bunker. Left open but unattended it will become a focus point for the untrammelled rage of the very worst people on earth, numbering billions globally, who believe an imaginary liberal conspiracy prevents them sending their children into school on public feast days dressed up as golliwogs, Enoch Powell, or the knights of the Ku Klux Klan. To placate them, the BBC’s vibrating cesspit of vile stupidity needs to be allowed to appear to continue to function, but within safer limits. Someone needs to wade into the stinkhole’s slimy opening, stand knee deep in the filth that pours from it, and regulate the flow. And that person, it appears, is Chris Evans. Like Han Solo in Star Wars: A New Hope, Evans is, historically, a mercenary figure, selling his considerable skills to the highest bidder, spouting populist rhetoric, while wearing a loose-fitting, but ultimately transparent, waistcoat of apparent rebelliousness and puckish individuality. But maybe the crisis caused by the endless toxic discharge issuing from the BBC’s subterranean bile-valve has forced Evans’s hand. Previous denizens of the hate-hole were a generation removed from Evans, in attitudes if not always in age. But Evans, despite his regrettable friendships with many of the earlier guardians of the pit, is a product of the post-punk Age of Enlightenment. While his mid-90s TV persona parroted the contemporary New Lad agenda, it at least appeared to do so with some degree of irony. But will Evans’s reflexive nuanced echoes still sound so strongly when his words have only the soft, filth-smeared flesh walls of the abominable sphincter to bounce off? The chalice Evans has accepted is poisoned, and there is some old wee or something on the bit where you hold it at the bottom, and that wee will probably go on his hand. But I give Evans my blessing, despite the fact that I, as a multi-Bafta award winning BBC star myself, have been anxiously awaiting the call to accept the detoxification job that he has finally been offered.